The Health O Meter wide platform digital wheelchair handrail scales provide the ultimate in usability, portability and connectivity. These scales feature folding handrails that can be folded onto the scale base to narrow the profile when transporting. Additionally, the base has four transport wheels on a wide side base that enables the scale to be freestanding when flipped onto its side and simply pushed by the operator to move. 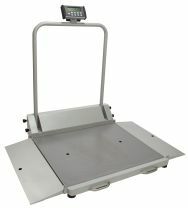 The scales in this series have Health O Meter's widest bases, 36 inches, to accommodate the widest bariatric wheelchairs. The digital indicators feature USB connectivity, BMI functionality and are EMR capable.